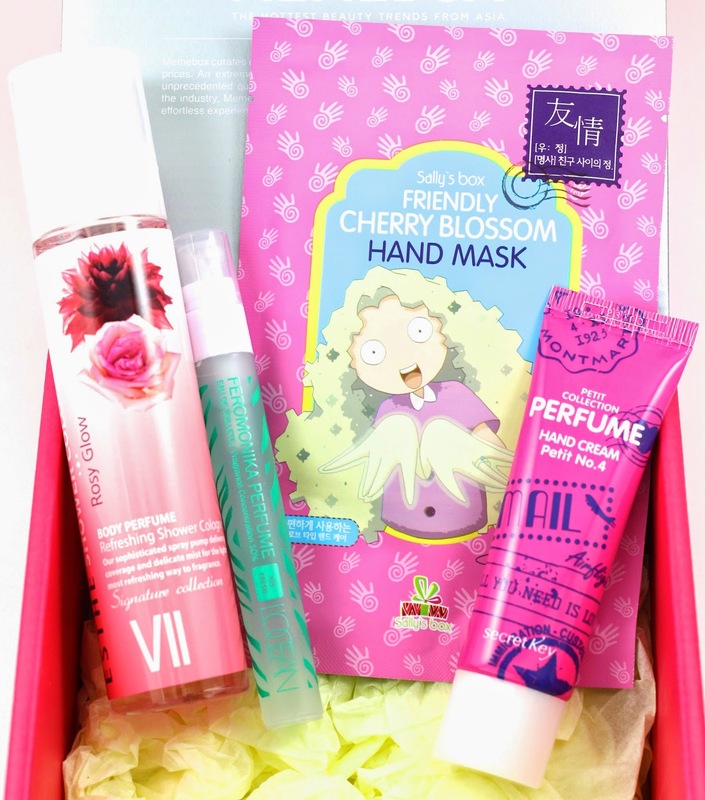 My Memebox Scentbox #4 Floral finally arrived. It was annoying having to wait the whole holiday weekend since they upgraded the shipping to expedited, and it shipped on a Friday I didn't get it until Tuesday because DHL doesn't deliver on Saturdays and there was the holiday weekend. I am a little irked at how these boxes were advertised in the bundle. It was a buy two get the third box free, but pay for shipping on two of those boxes. Then they sent it DHL Express shipping, which wasn't what was advertised. It just rubbed me the wrong way that they chose a cheaper shipping option that did not cost them the amount we paid for two boxes to be standard shipped. 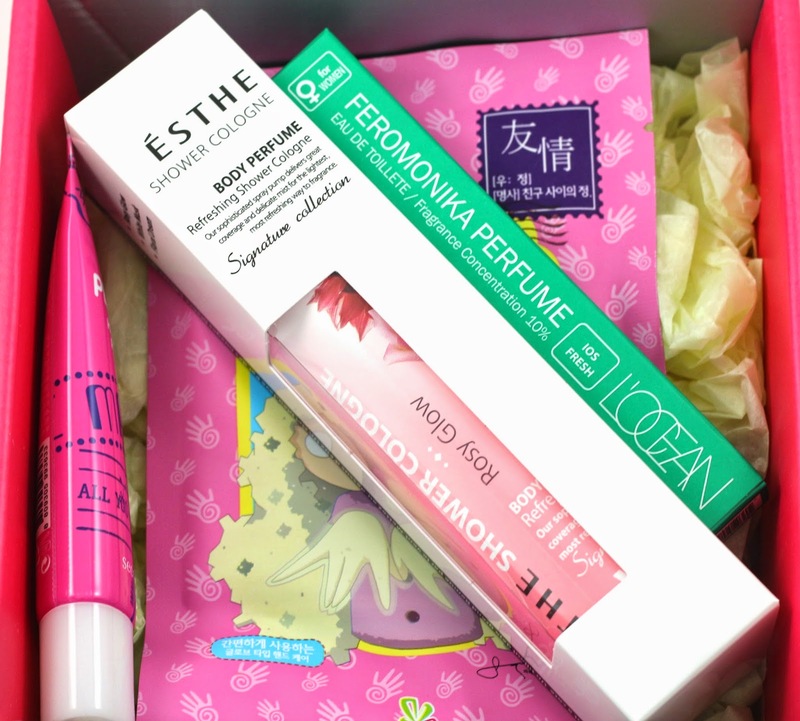 Because of this upgrade to DHL Express shipping on the Scentbox bundle, I got this box in 5 days accounting for time zone changes, from Korea to California. This box alone was $15 (plus $6.99 shipping) and is now sold out. 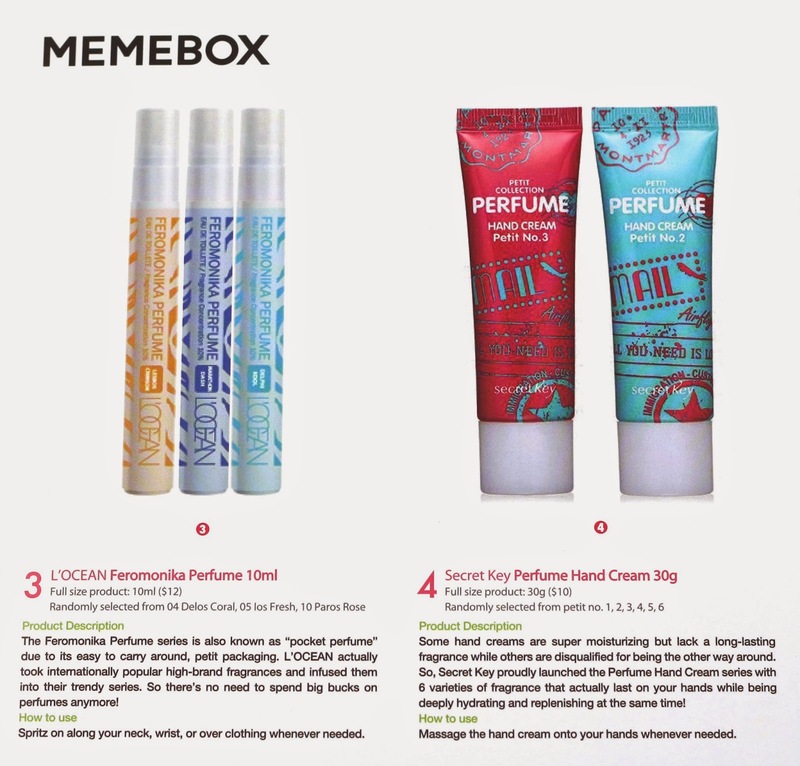 Only 4 products in the Scentbox #4 Floral, which is better than three, which was the amount that was supposed to be in these scent boxes. 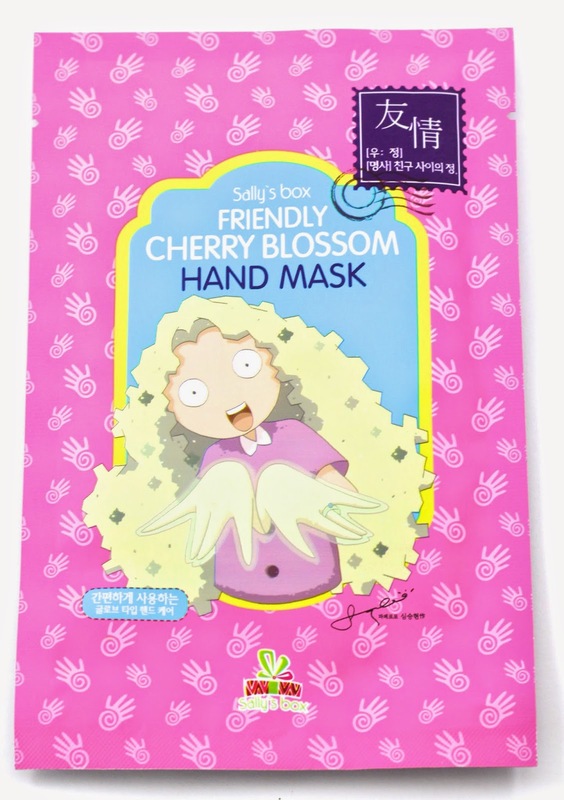 Product description: "An easy-to-wear glove type hand care enriched with cherry blossom extracts and shea butter, the Friendly Cherry Blossom Hand Mask will deliver intense hydration and nutrition to your dry, roughened hands." How to use: "Wash your hands thoroughly. Cut the hand mask in half along the dotted line, splitting it into a pair. Wear the hand mask on both hands and rest for 10-15 minutes. Remove and pat in the remaining essence for full absorbance." My thoughts: I think the wording on this product is pretty bad, it makes it seem like you get two sets of masks, but really they just mean you get one for each hand...it's terribly worded marketing. Anyways, I used this and I don't think it smells like Cherry Blossoms at all. I don't think it left my hands any softer or my cuticles looking less rough. It took a long time to sink into my hands after I took the gloves off, and left them feeling greasy and oily. I don't think hand or nail masks agree with me. I just need some heavy duty cuticle oil is what I need. 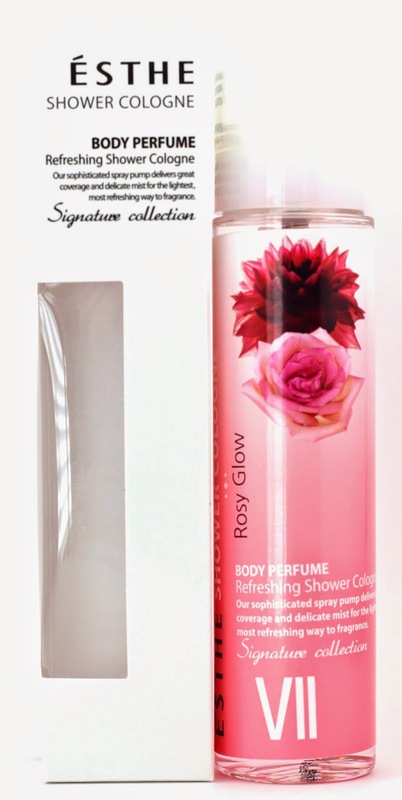 Product description: "ESTHE's Shower Colognes are finely-spraying body perfume that come in three most popular floral fragrances - soft, lovely rose bouquet scent, delicately sensual white musk scent, and refreshingly fruit and citrus floral scent." How to use: "Spray the Shower Cologne all over your body after a shower." My thoughts: Out of the bottle this smells like hand sanitizer it's got so much alcohol in it. Definitely not high quality, and when sprayed it smells like a slightly rose scented men's cologne. It's awful. I won't be using this. I don't even know what to do with something like this, I don't think anyone would be interested in trading for it, or using it, but I also don't want it to go to waste. I could donate it I guess, but I would feel bad it smells so terrible! Product description: "The Feromonika Perfume series is also known as "pocket perfume" due to its easy to carry around, petit packaging. L'Ocean actually took internationally popular high-brand fragrances and infused them into their trendy series. So there's no need to spend big bucks on perfumes anymore!" How to use: "Spritz on along your neck, wrist, or over clothing whenever needed." My thoughts: The scent I got smells kind of fresh and aquatic, but on the skin it smells pretty bad, very artificial. It might be ok as a room spray or clothing spray, but I can't see myself using this often. Maybe in the car to freshen it up? I laugh at the description line that says there's no need to spend big bucks on perfumes anymore. Yeah, you're right, there isn't. I can get Indie sample perfume oils that smell way better and have a much higher quality for a few dollars each. Certainly better quality and fragrances than this one. Product description: "Some hand creams are super moisturizing but lack a long-lasting fragrance while others are disqualified for being the other way around. So, Secret Key proudly launched the Perfume Hand Cream series with 6 varieties of fragrance that actually last on your hands while being deeply hydrating and replenishing at the same time!" How to use: "Massage the hand cream onto your hands whenever needed." My thoughts: I'm under no illusion that this tiny product is "full size", it's definitely a travel size, but I'm sure that because they sell it that way, it's classified as full size. I got another Secret Key product in a mysterious numbered scent, and this is the same. It's apparently a "Bergamot Peach Rose" but on the skin, it dries down to be vaguely vanilla scented, but still mainly rose. It's a light lotion, and seems to moisturize well, but I have other lotions that hold their scent better than this one. 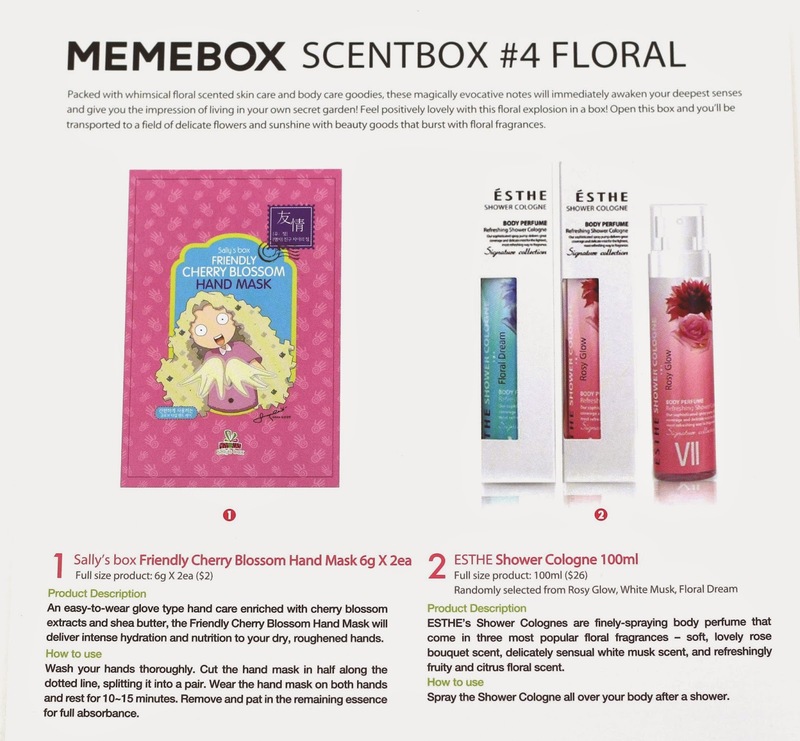 What did you think of the Scentbox #4 Floral? Let me know in the comments! It seemed like such a good box. It's sad that the products doesn't deliver... that rose spray could probably be used to deodorize curtains and sofa covers. Sometimes (like in the kitchen) odors get trapped, and it the spray isn't good enough for the body, it could probably be used elsewhere. ;) Thanks for sharing! It wasn't great was it? Particularly sad when you consider that the rose box was a real highlight in the last scent bundle.